The 2" Italian Metal Staunton Chess pieces are perfect to fit smaller size chessboards. Each etched textured piece is crafted by Italfama; one of the best known Italian chess houses in the world. The base of this set is 0.75 inches. P093-316. Florentine Staunton Brass & Silver Finished Chess Pieces. Chess players have always appreciated the traditional design of these deluxe Florentine Staunton Style solid brass chess pieces. These pieces are hand crafted from the finest cuts of brass and feature felted slides. The king is 2 inches tall and the base is 3/4 of an inch. P210- 2125E. Egyptian White Metal Chess Pieces. The ancient Egyptian Empire comes alive with these chessmen set! The hand painted pieces will captivate the imagination of players of all ages. This is a must for the true chess collector! The king measures 2 1/8". P211-2125G. The Crusades, White Metal Chess Pieces. The legend of the crusades comes alive with these fabolous chessmen! These hand painted chessmen are intricately made from white metal. The set will be admire and will captivate the imagination of all players . Includes 32 chess men, 16 Christian and 16 Muslim. The king measures 2 3/4". P209-2125B.. Chinese Qin Dynasty White Metal Hand Painted Chess Pieces. Re- live the ancient Chinese Qin Dynasty with these gorgeous chessmen set! The beautiful chess pieces will captivate the attention and imagination of young and adults. The chess pieces on this set are hand painted and hand crafted from white metal. The king in these set measures 2 3/8”. P071-750. Gothic Brass & Silver Finished Chess Pieces. These metal and pewter chess pieces are made to perfection. They remind us of the historical past of Emperor Napoleon Bonaparte and one of his greatest battles, The Battle of Waterloo. The King is 3 1/8 inches Tall. The base is 1 1/8 in. P008-70M. Staunton. Filigree Metal Chess Pieces. These stunning Staunton chess pieces are crafted by Italfama of Italy. They are made of fine solid brass and are nickel electroplated. They carry beautiful designs hand etched on the metal. These pieces provide great value, and feature felt slides and their own storage box. The King’s height is 3 inches, and the base width is one inch. P062-639. Brass & Silver Hannibal Roman Chess Pieces. These chess pieces represent the Roman Hannibal. The pieces are made by the best Italian artisans from durable brass & Silver. The pieces have felted slides for better control.The King is 3 inches tall with a 1 inch diameter base. P012-142MW. Staunton. Arabescato Style Brass Wood Chess Pieces. Italfama's Arabescato Basswood Chess pieces share the same styling cues as their solid Brass siblings but have a center of solid Italian Poplar wood. The Brass areas are engraved by hand with a beautiful classic motif. The King measures 10.2 cm, and the base is 2.8cm in diameter. P034-1639. Hand Painted Hannibal Roman Chess Pieces. P005-82M. Staunton Italian Metal Chess Pieces. 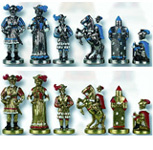 These magnificent chess pieces are crafted from metal by the famous Italian Chess house Italfama. Felt slides line the bottom of each piece for improved playability. The king is 4 inches and the base is 1.25 inches in diameter. Mary Stuart Queen of Scots is a very popular item from the Italian chess manufacture Italfama. Queen Mary was born during the reformation and lived a controversial life when Catholicism fought Protestantism for control. She was executed while linked to a plot to assassinate her cousin queen Elizabeth from England. The king is 3.75¨tall with a 1.5¨base. P003-75B. Persian Brass Chess Pieces. These Persian Chess Pieces are made of the highest quality of craftmanship, imported from Italy. Manufactured by the Chess house Italfama, they are made of solid brass, with felt slides for improved playability. . The king is 3 inches and the base is 1 inch. Travel back to the memorable dark ages with its crusading warriors with this handsome limited edition chess set that is intricately made from solid brass and nickel plated cast hand painted to detailed with felted pads for better game play. The set includes the historical icons of the period. The king height is 3.625¨with a king base of 1.25¨. Recommended board size is 2¨- 2.25¨ squares. These unique and modern solid Brass chess pieces have a deco style that complements any chess set. 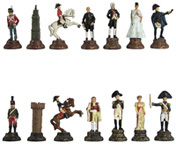 The world famous Chess Set manufacturer Italfama manufactures them in Italy. Each set comes with felt slides and its own storage box. The king is 7.3 cm. The base has a diameter of 2.7 cm. P001-46M. Roman Metal Chess Pieces. These Italian Chess Pieces are made of high quality metal. True works of art, they have felt slides for better control.. The king is 4.75 onches, and the base is 1.5 inches. P109-819. The Imperial, Metal Hand Painted Italian Chess Pieces. These Mariner chess pieces have a unique Imperial Design. They are hand painted by the best Italian Artisans from pure metal. The King is 3 1/2 inches tall with a 1 1/4 inch diameter. These Napoleon Italian chess pieces have a unique and attractive appearance.They are hand crafted by some of the best artisians of the world from brass. The bottom of each piece has a felt slide that provides better control and playability. The King measures 3 3/4". P004-ITP28B. French Brass Classic Staunton, Chess Pieces. These classic style Staunton Chess Pieces are made in Italy using the highest quality French Brass by the Chess manufacturer Italfama. These heirloom pieces come standard with felt slides that improve playability and control, and a storage box to protect your pieces. The king is 7.5 cm., and the base is 2.4 cm. P016-150GS. Persian Style 18K Gold & Silver Plated Staunton Chess Pieces. These giant Persian Staunton Chess pieces are plated in 18K Gold and Sterling Silver. Each piece has a ring of metal around its base, giving it a unique and striking appearance. The traditional style features Poplar wood centers on each piece, and felt slides that contribute to better control and playability. The King's height is 9 cm. and the base diameter is 3.2 cm. P002-48M. Renaissance Metal Chess Pieces. These unique Renaissance Chess pieces are crafted in Italy of solid metal . The pieces feature felt slides. The King measures 5.5 inches tall with a 1.5 inch diameter base. P015-1540. French Style, 24kt Gold & Silever Plated Staunton Chess Pieces. These French style Staunton 24KT Gold and Silver plated Chess pieces are hand crafted by the artisans of the prominent Chess maker Italfama. The pieces have centers finished in luxurious solid Poplar wood, and felt sliders on the bottom to assist in control during play. The King measures 4" tall with a base diameter of 1 1/8". These hand-crafted exquisite chess pieces have an elegant design. They are made from the finest cuts of maple and walnut wood with 24kt gold and silver plated. They feature felted slides for added playability, protection and control. The king is 5 inches tall and the base is 1 ¾ inches in diameter.